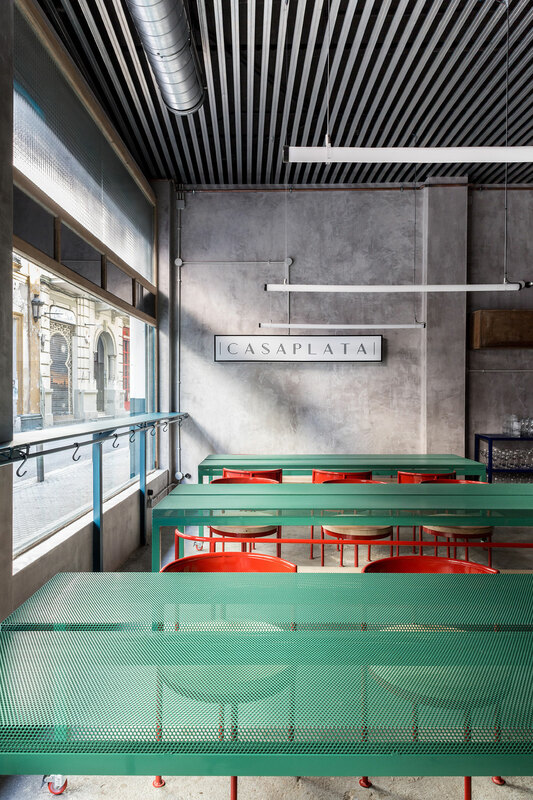 Eschewing the revivalist aesthetic that many public venues in the centre of Seville champion, Casaplata restaurant and cocktail bar by Spanish architects Lucas y Hernández-Gil espouses a radically modernist sensibility of raw sophistication that combines the grace of Italian artist Giorgio Morandi’s visual language with the grittiness of an urban aesthetic. 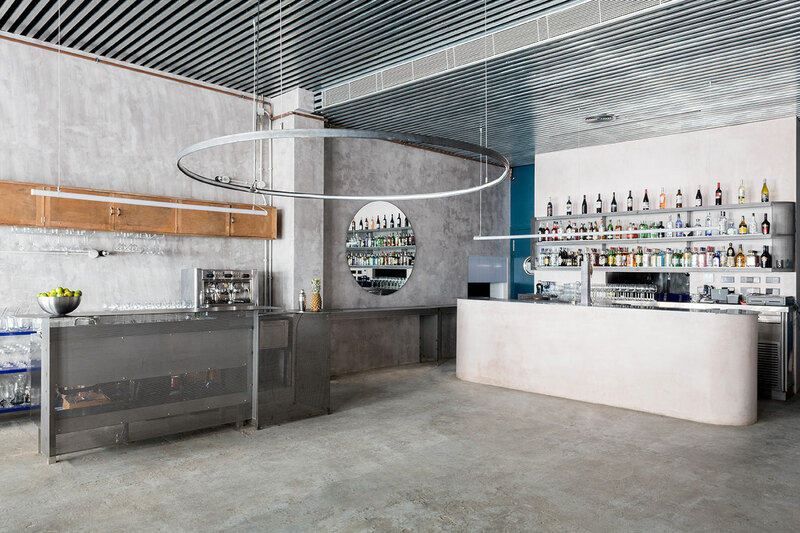 Housed in a large ground floor space, the dining area is located at the front of the house where large street windows provide ample illumination, while the bar is placed at the back. 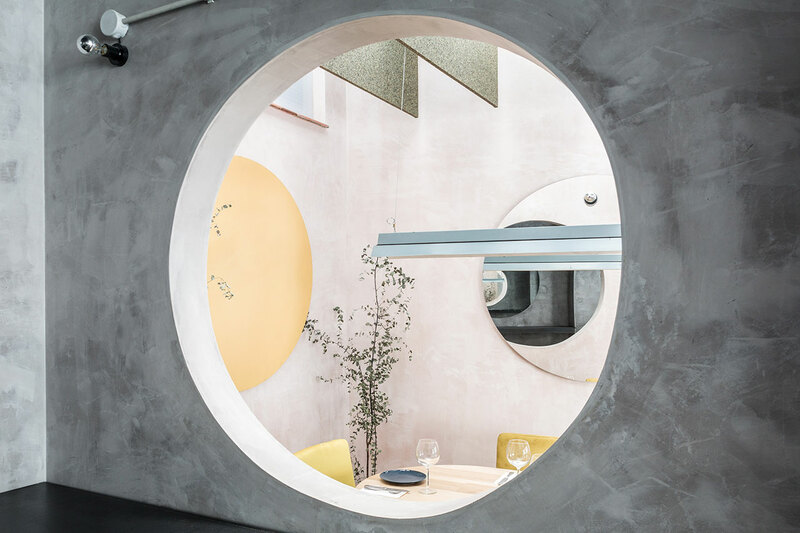 Additional seating can be found alongside the wall as you walk in, while a small private dining space awaits further on. 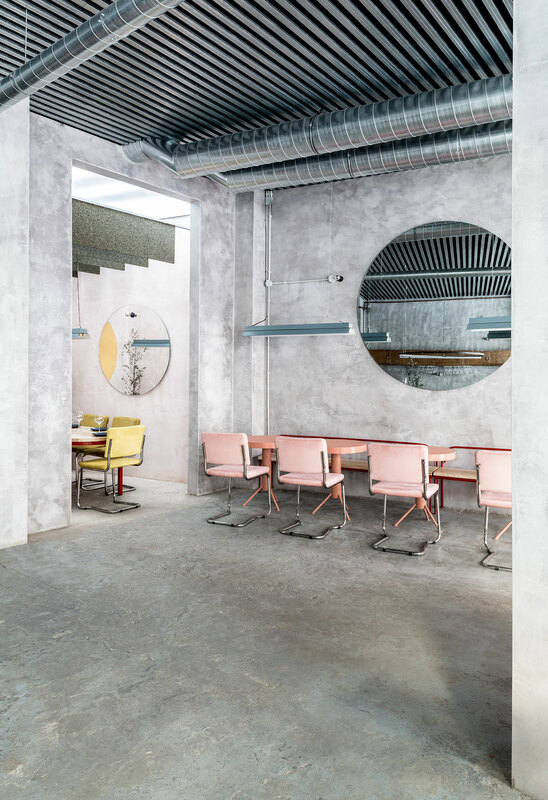 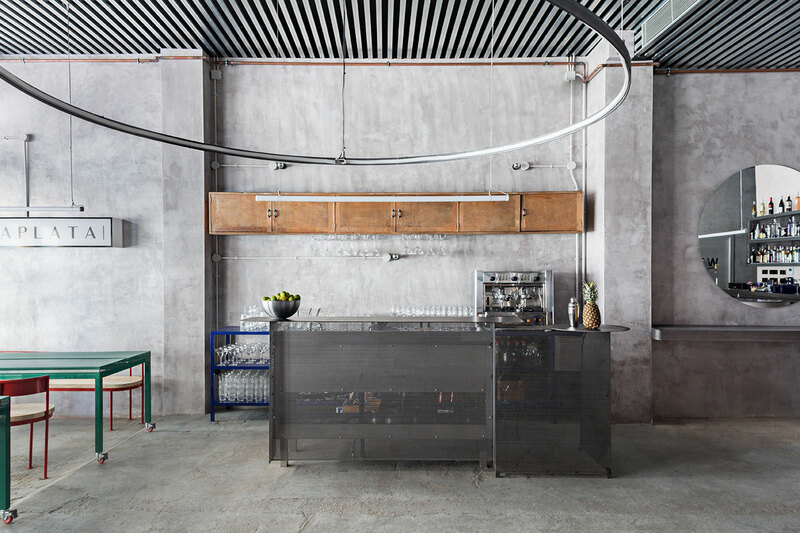 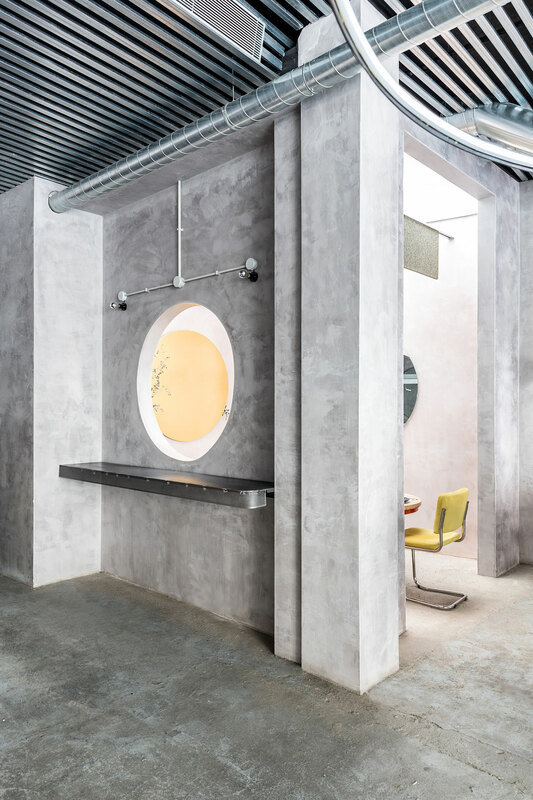 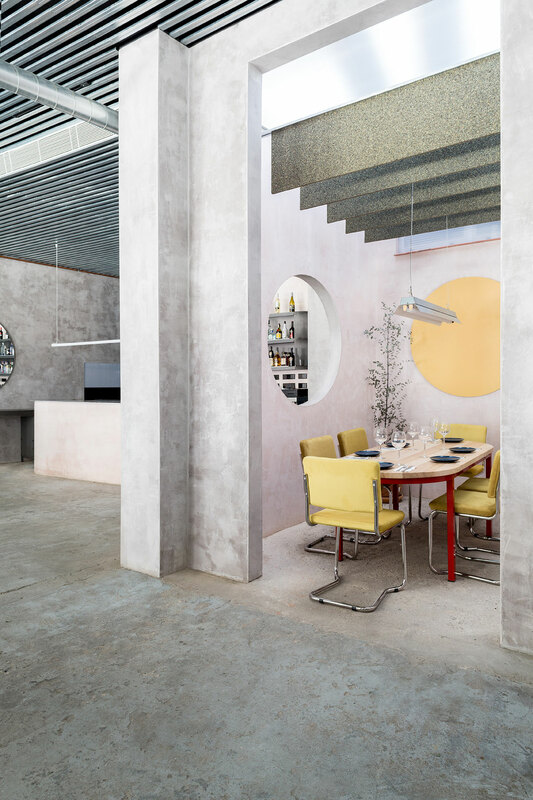 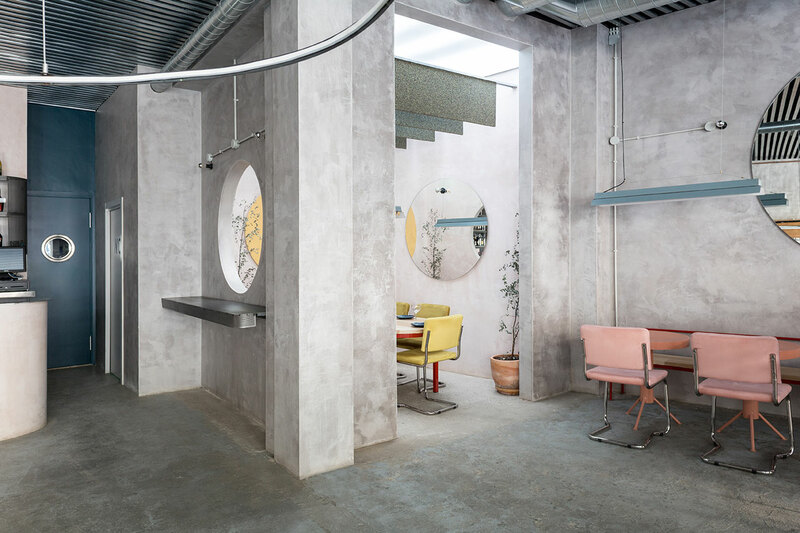 The interior design is inspired by the soft colour palette and the elemental geometric shapes of Morandi’s still-life paintings, and conceived as a uniformly grey canvas, made up bare concrete for the walls and floors and corrugated metal for the ceiling, against which an assortment of clearly defined shapes and colours pop out. 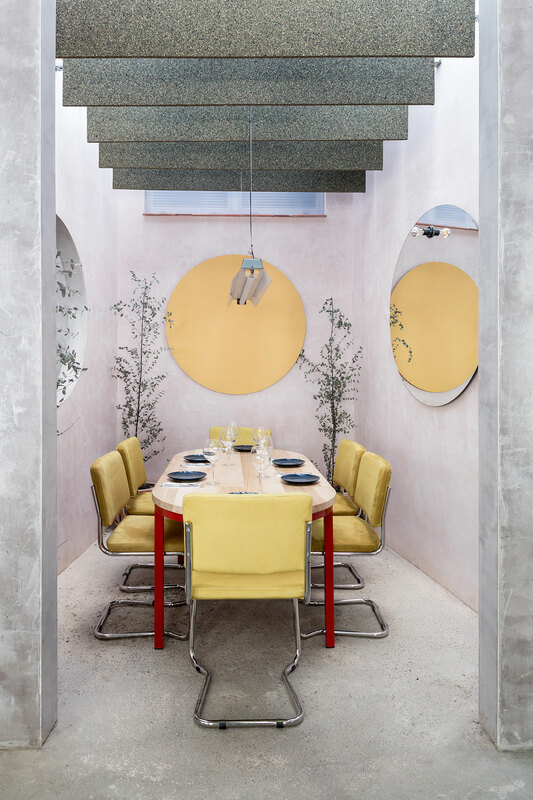 Rejecting any ornamentation or decorative flourishes, the interior design relies instead on geometric shapes and blocks of colour to jazz up the otherwise plain interiors. 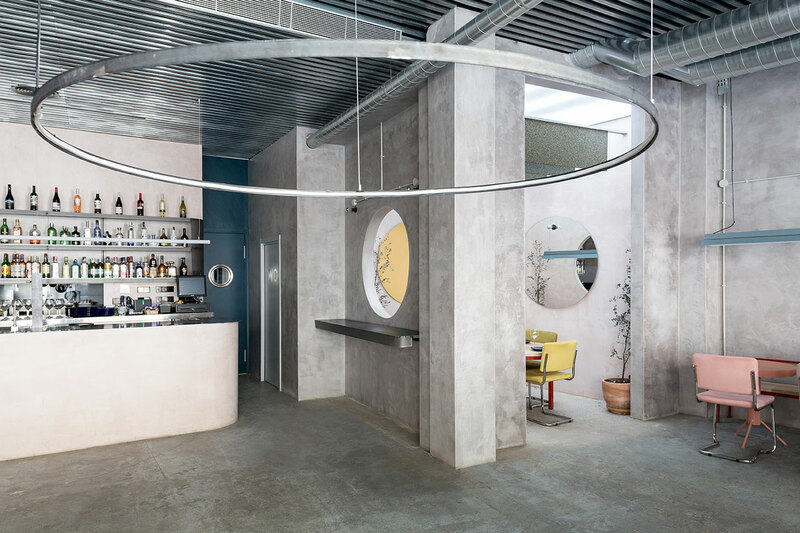 Among those shapes, the most ubiquitous is the circle. 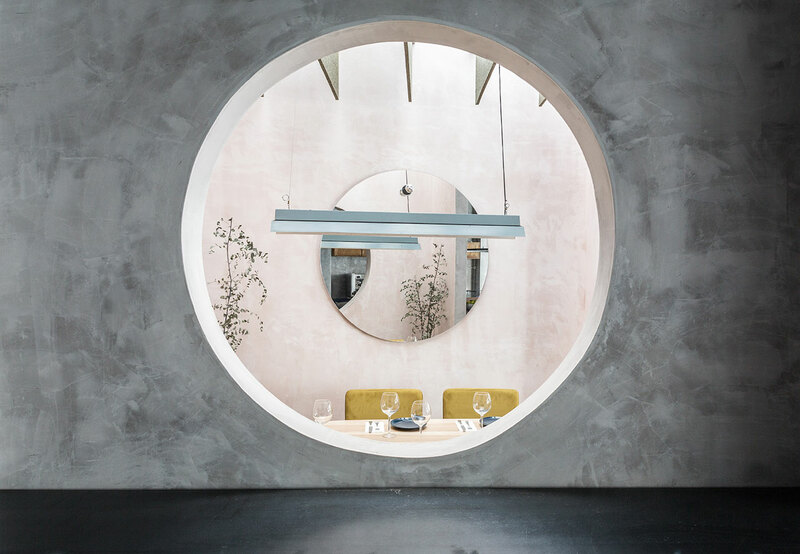 From the numerous round tables of different sizes and the slender, ring-like chandeliers that hang above them, to the circular mirrors and wall openings, the circular elements have an elegant perfection and latent suppleness that soften the harshness of the prevailing industrial aesthetic of unrefined textures. 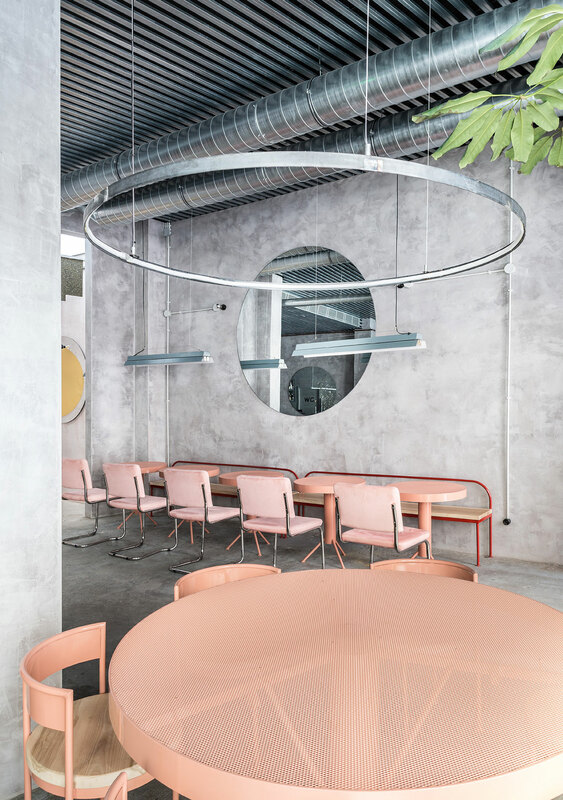 So do the various blocks of colour that populate the space in the form of tables, chairs and counters, enlivening the achromatic building fabric. 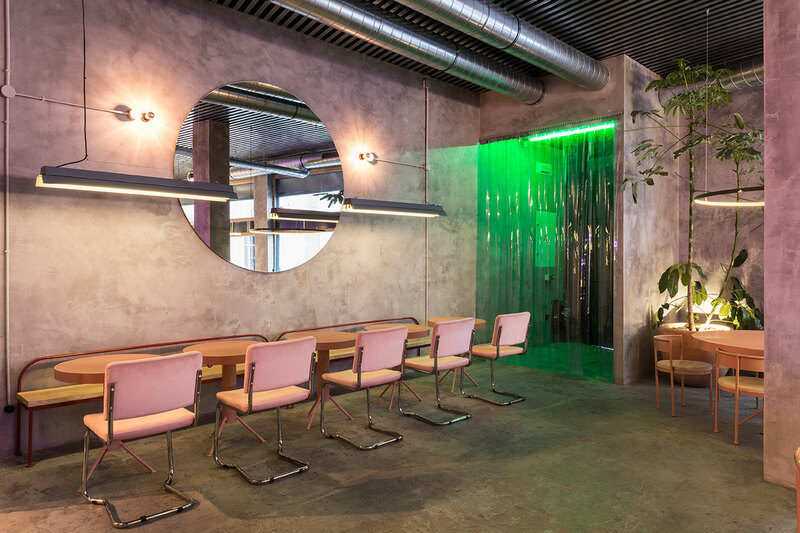 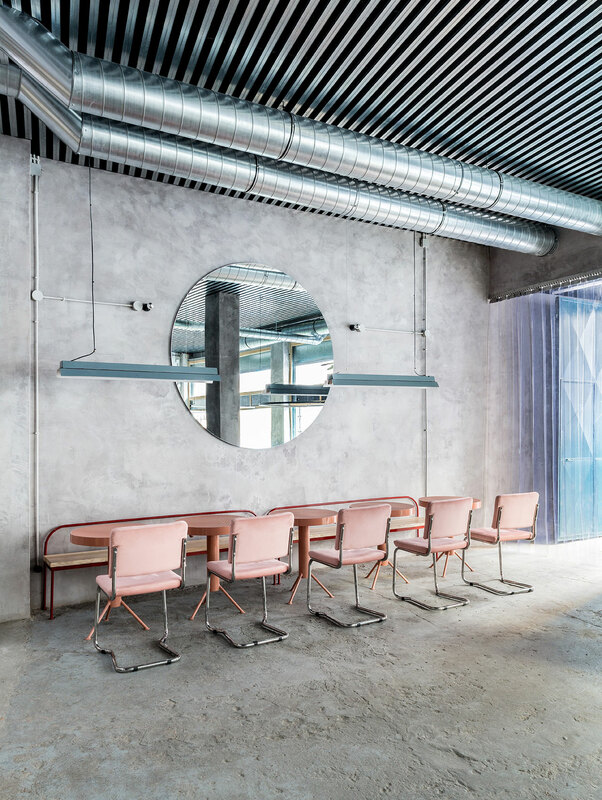 The subtle playfulness of the colourful geometric language is enhanced by the use of perforated sheet metal for table tops that imbues a sense of lightness against the brutalism of the concrete surroundings, as well as the presence of planted vegetation and the softness of the felt textile panels that populate the private dining room's ceiling. 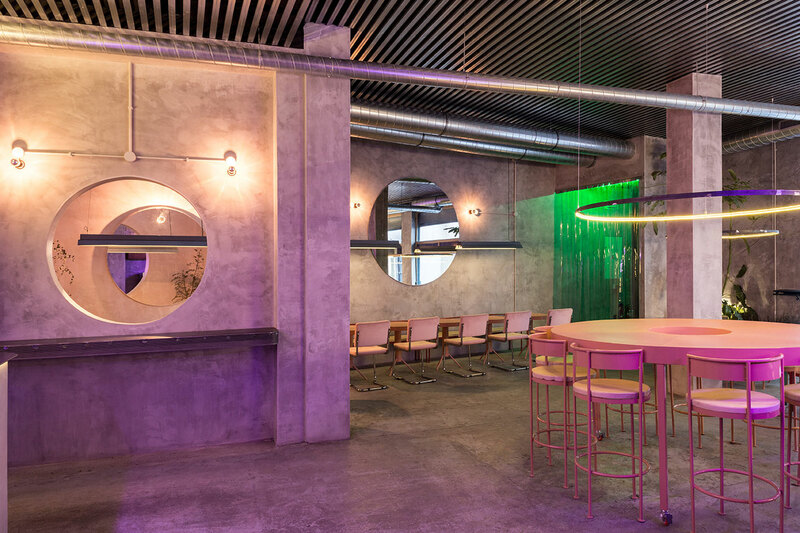 Come night time, a purple fluorescence envelops the establishment, while a green glow welcomes guests at the door, completely transforming the coolness of the daytime interiors into a mesmerizing ambience where guests can relax sipping their cocktails or try their best dance moves to the DJ's groovy selections.